Hawick Rugby Club is hoping to secure victory of a different kind this weekend by winning a late license application for the clubrooms. 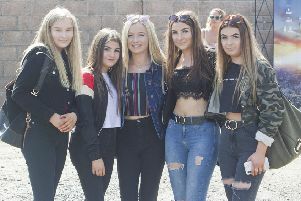 But the Mansfield Park outfit faces stiff opposition from the police, as well as strict rules from Scottish Borders Council officials, if its bid to stay open for an extra hour till 2am following the final of the BT Scottish Cup against Boroughmuir at Murrayfield tomorrow, is successful. It is the Hawick game’s kick-off time of 5.45pm at the national stadium - which win or lose, will see the team and supporters not returning to Hawick until around 11pm - that has prompted club secretary Rory Bannerman to lodge the application to allow the clubrooms to stay open longer, allowing a proper welcome-home party for the fans, players and officials. But the decision will be made by the Scottish Borders Licensing Board today (Friday), and police have not backed the one-off application. Reservations about the one-hour extension are also expressed by Ian Tunnah, Scottish Borders Council’s licensing standards officer. He says that if the board is minded to grant the application, it should insist that licensed stewards are deployed to control noise from the clubrooms and ensure guests are safely and quietly dispersed.